AzhwAr says in this pAsuram that not only thiruvEngadam, but all the dhivyadhEsams (divine abodes) where emperumAn is dwelling have this special quality [of granting SrIvaikuNtam]. If we meditate on the deeds that emperumAn has carried out for our sake, the sins due to our deeds will disappear. AzhwAr says that all the sins that we had accrued due to our deeds carried out in our standing, sitting, lying and moving postures will disappear if we think of the benefits that he granted to us in his standing, sitting, lying and moving postures. 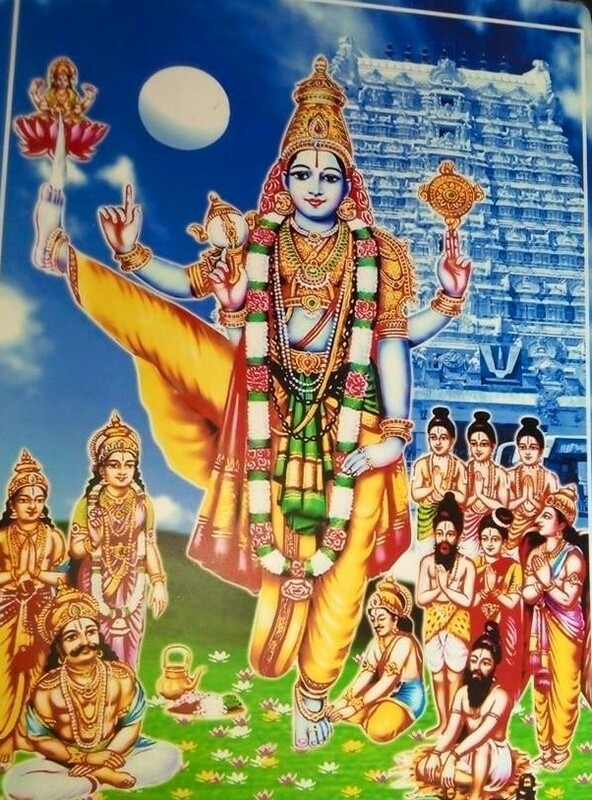 nIL kOval ponnagar nadandhAn… – if we meditate that he is walking in the dhivyadhEsam thiruukOvalUr which is famous and delightful, our sins will disappear. ahkAdha pUngidangin nIL kOval ponnagarum – since this was the dhivyadhEsam where emperumAn jostled with AzhwAr(s), he is thinking back sweetly, of this dhivyadhESam. ahkAdha kidangu – the moats are very close to each other in a protective way in this dhivyadhESam where emperumAn and his followers [the first three AzhwArs] jostled for space. pUm kidangu – beautiful moat. If one were engaged with the moats, the mind will not go towards even emperumAn. ahkAdha pUm kidangu – moats wherein the flowers are in full bloom, in clusters. pUm kidangin nIL kOval ponnagar – if one were to shift the vision beyond the moats, the sweetness and beauty of this place will attract one’s eyes and heart. ponnagar – AzhwAr terms this dhivyadhESam as ponnagar (golden place) since emperumAn came on his own, jostling with the AzhwArs for space and graced them. vEngadamum viNNagarum vehkAvum … kOval ponnagarum – even though these dhivyadhESams are far apart from one another, AzhwAr combines them since they are related to emperumAn and are enjoyable for AzhwAr. nAngidaththum ninRAn irundhAn kidandhAn nadandhAnE enRAl – if one were to think that emperumAn toiled hard in these four places, standing, sitting, reclining and walking, in order to attain his followers, his sins will disappear. enrAl kedum – one need not reside in these dhivyadhESams. Even if one were to meditate on emperumAn’s dwelling in these places, that person’s sins will get destroyed. enRAl kedum – the meditation need not be carried out with the knowledge that it would be a path to attain emperumAn. Even if it is said just for the sake of saying, the sins will disappear. periyavAchchAn piLLai, one of the commentators for this prabandham, will say “just as one’s distress disappears on calling out to mother”. nAngidaththum ninRan irundhAn kidandhAn nadandhAnE enRAl kedum – if one were to meditate on emperumAn’s deeds while he was standing, sitting, reclining and walking, all the results of sins carried out by the person in these four postures will disappear. idar kedumAm – mentioning about anishta nivruththi (removal of undesirables) implies ishta prApthi (attaining the desirables) too. We shall consider the 78th pAsuram next. This entry was posted in iyaRpA, mudhal thiruvandhAdhi on August 26, 2017 by T N Krishnan.